What a fun idea. I might snag a couple of these. Thanks! These things sound delicious! I get bored eating the same thing for breakfast everyday, so I alternate between cereal, toast, oatmeal, and scrambled eggs! I need to make some muffins! I usually eat cereal, oatmeal, once a week I eat an egg and sometimes, when I’m not in the mood for any of that, bread or toast with nutella. Yum! Sounds like some great breakfasts! I usually eat a cereal bar when I get to work, and then yogurt a little later. Boring. Well recipe for tasty and healthy breakfasts are a lot, all depends on how much time you have to prepare it. Me, for example, during the week i don’t have time, so i eat fruits, yogurt and cereal bars, but in the weekends i have to say that i like to spoil myself with nice and tasty recipes like: savory omelet with mushrooms, red and green peppers and anything that passes through my head. Another thing i just love to eat is bruschetta with fresh tomatoes, basil, salmon fume and cheese, you name it. 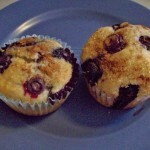 The Blueberry Muffins look really good!